We are a team of professionals with an extensive experience in the practice of law. Our goal is to provide a complete customer service, offering our experience and working with rigor and full dedication, not to mention the personalized service that this entails. Law degree from the University of Barcelona. She began her professional career working in public sector. After graduating, she joined the Secretariat and Legal Services department of the Barcelona Provincial Council (Departamento de Secretaria General y de Asesoría Jurídica de la Diputación de Barcelona). After, she served as legal advisor of the Franqueses del Vallés City Council Secretariat. Later she joined the firm of Mr. Jaime Sánchez Isac, a recognized specialist in administrative law. There she specialised in Administrative Law, and contentious-administrative litigation and planning law. She is currently head of the Administrative Law department at Pou de Avilés. Barcelona Bar Association member since 1991. Expertise: Civil Law and Arbitration. He joined the firm Pou de Avilés in 1991, after having worked in private business sector. Extensive experience in the field of civil law, in general, and arbitration, in particular. 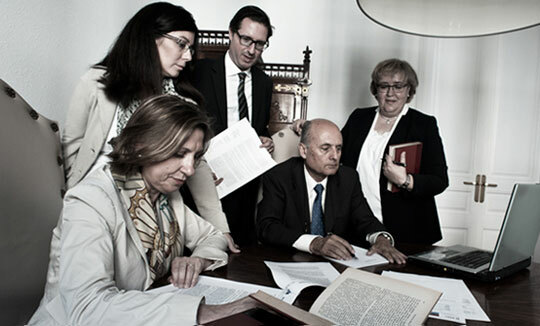 Collaborates as an arbitrator at the TAB (Barcelona Arbitration Court), and at the Consolat de Mar of the Official Chamber of Commerce, Industry and Shipping of Barcelona. Master in Law by ISDE. State official for retired civil servant pensions. Tarragona Bar Association member since 2004. Expertise: Civil Law, Family Law and Civil Procedure. After completing her Law degree and Master in Law at ISDE, she joined the Barcelona office in 1997, specialising in Civil Law, Real Estate, Family Law and Administrative Law in the State pensions sector. She is the head of Tarragona's office. Barcelona Bar Association member since 1985. Expertise: Civil Law, Civil Procedure and Arbitration. Extensive experience in Civil Law, Family Law, Arbitration and Civil Procedure. In 1984 she joined the firm Pou de Avilés where she has specialised in arbitrations, high court appeals and all proceedings in the field of civil jurisdiction. Active member of AEAFA and SCAF (the Spanish and the Catalan Associations of Family Lawyers). Law degree from the University Abat Oliba. PhD and Proficiency in Academic Research at the UB Law Department. Barcelona Bar Association member since 1999. Professor of Private Law (Civil Law Unit) of UAB since 1999. After completing a Law degree and PhD, he joined the firm Pou de Avilés where he has combined his professional career with university teaching at the UAB, specialising in Civil Law.